11% of internet users (representing 9% of all adults) say that they have personally used on online dating site such as Match.com, eHarmony, or OK Cupid. 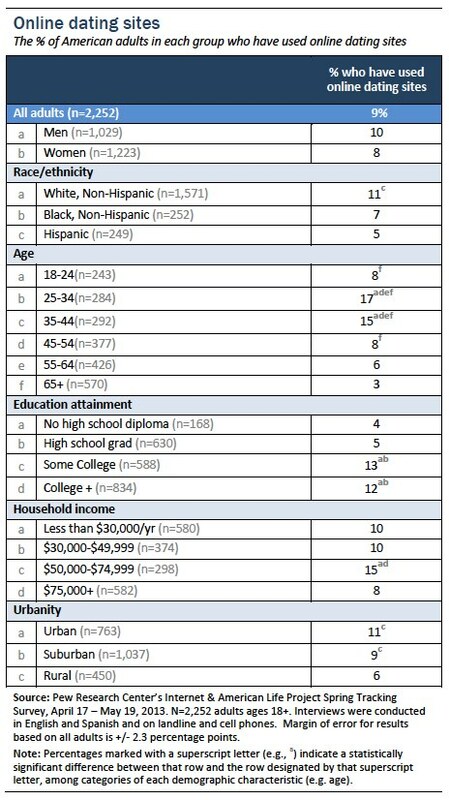 The questions we have used to measure online dating have evolved over the years, and as a result we cannot directly compare the size of the total online dating population to some of our earlier surveys on the subject.6 However, the use of online dating sites7 has become steadily more prevalent in recent years. In 2008 just 3% of all Americans said that they had used an online dating site; by 2009 that figure had risen to 6% of all Americans, and today 9% of the adult population has used an online dating site. 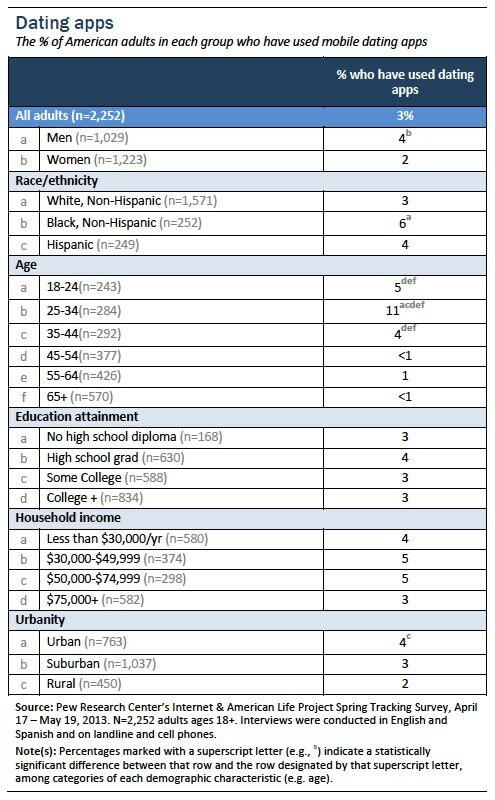 In terms of demographics, online dating is most common among Americans in their mid-20’s through mid-40’s. Some 22% of 25-34 year olds, and 17% of 35-44 year olds are online daters—that is roughly double the rate for those ages 18-24 or those ages 45-54. 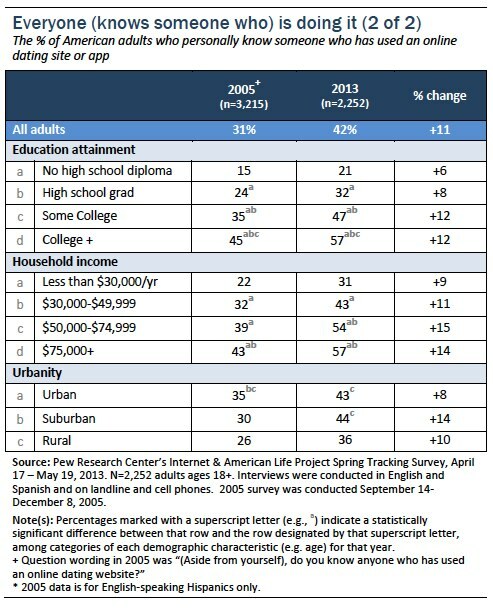 Urban and suburban residents are more likely than rural residents to use online dating, and those who have attended college are around twice as likely to do so as are those who have not attended college. Of course, only a portion of the population is in the market for a relationship at any given time. Some are currently in long-standing relationships that predate the adoption of online dating, while others are single but not actively looking for a romantic partner. 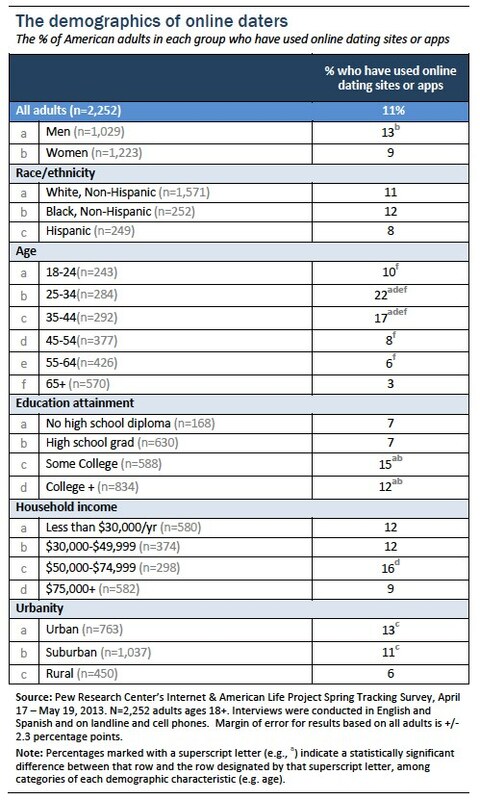 If we examine only those Americans who are most inclined to online dating—that is, the 7% of the public that is both single and actively looking for a partner—some 38% of these individuals have used online dating sites or dating apps. Looking separately at the two distinct elements that make up definition of an online dater, some 11% of internet users say that they have used an online dating site. This does not include users of mobile dating apps, which will be discussed in the next section of the report. Since 85% of the population now goes online, that means that one out of every ten Americans (9%) has used an online dating site at one point or another. 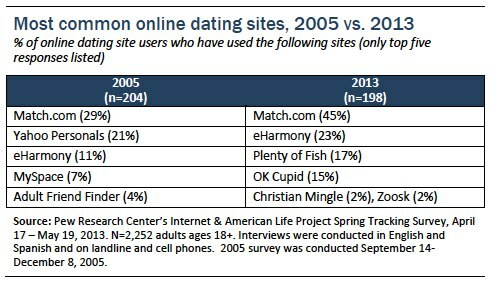 The online dating marketplace has undergone dramatic changes since we conducted our first study on this subject in 2005. In particular, many services now offer cell phone apps that allow users to update their profile, search the profiles of others, and find potential dates in their area using their mobile phone.9 For the first time in our 2013 survey we asked specifically about the use of these cell phone dating apps. Among those who use cell phone apps, 7% say that they have specifically used a dating app on their phone. Since 45% of all Americans are app users, that means that 3% of the overall adult population has used a cell phone dating app at one point or another.10 Similarly, 6% of smartphone owners have used a mobile dating app. Although online dating sites are relatively common among a range of age cohorts, mobile dating apps are primarily popular with Americans in their mid-20s through mid-30s. One out of every ten 25-34 year olds (11%) has used a dating app—that is double the rate for those ages 18-24 (5% of whom have used dating apps) and for those ages 35-44 (4%). Older adults use online dating sites in at least modest numbers, but dating app usage is effectively non-existent for people in their mid-forties and beyond. 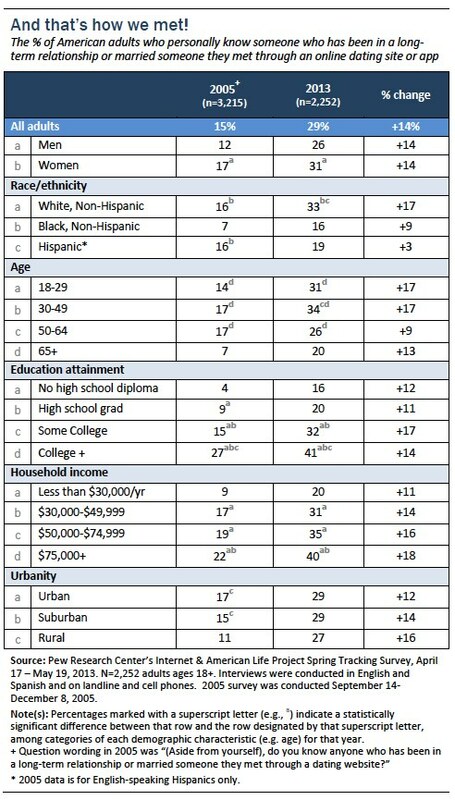 The median ages for online dating site users and dating app users are illustrative in highlighting the age differences between each group. The typical (median) online dating site user is 38 years old, while the typical (median) dating app user is 29 years old—nearly a decade younger. 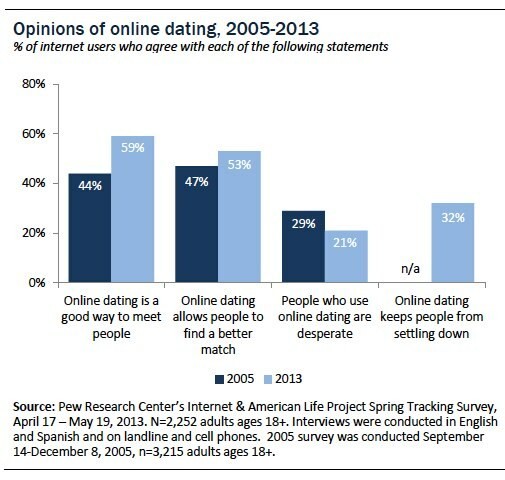 Although the proportion of Americans who say that they personally use online dating has not changed dramatically since 2005, familiarity with online dating through others (i.e., knowing someone who uses online dating, or knowing someone who has entered into a relationship via online dating) has increased significantly over that time. 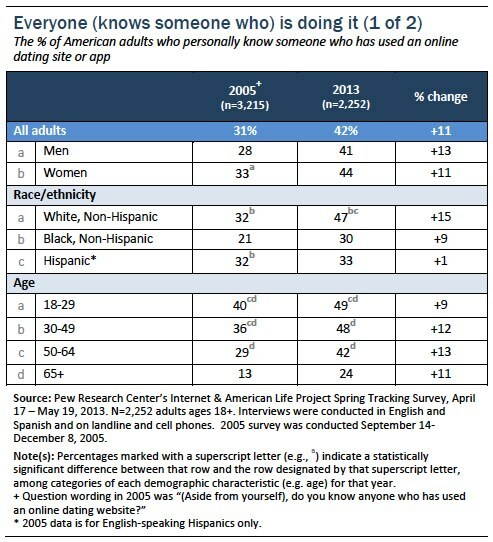 Some 42% of Americans now know someone who has used an online dating site or app, up from 31% in 2005. And twice as many people now know someone who has entered into a marriage or long-term relationship after meeting through an online dating site or app—29% of Americans now know someone who met their partner this way, compared with just 15% in 2005. Overall, college graduates and those with relatively high household incomes are especially likely to know someone who uses online dating sites or apps. However, every major demographic group is now significantly more likely to respond in the affirmative to this question than was the case when we first asked it in 2005. Notably, Americans ages 65 and older are now twice as likely to know someone who uses online dating than they were in 2005 (24% of seniors now know an online dater, compared with 13% who did so eight years ago). Similarly, college graduates and the relatively affluent are especially likely to say that they know someone who has met a spouse or long-term partner via online dating—and once again, nearly every major demographic group is more likely to know someone who has done this compared with eight years ago. Seniors are again especially notable in this regard, as 20% of those 65 and older now know someone who has entered into a serious relationship with someone they met via online dating. That is a three-fold increase over the 7% of seniors who said “yes” to this question in 2005. 59% of internet users11 agree with the statement that “online dating is a good way to meet people,” a 15-point increase from the 44% who said so in 2005. Additionally, one-third of internet users (32%) agree with the statement that “online dating keeps people from settling down because they always have options for people to date.” This is the first time we have asked this question, and therefore we cannot determine how it has changed over time (if at all). Perhaps unsurprisingly, people who have used online dating themselves have positive views about the process compared with the overall population. Some 79% of online daters agree that online dating is a good way to meet people (compared with 53% of those who are not online daters), and 70% agree that it helps people find a better romantic match because they have access to a wide range of potential partners (compared with 48% of those who are not online daters). And people who know someone who uses online dating sites—or know someone who has met a spouse or partner through those sites—have significantly more positive views about the benefits of online dating than do people with less second-hand exposure to online dating (although these “second hand” users are not quite as positive as are those who use online dating personally). 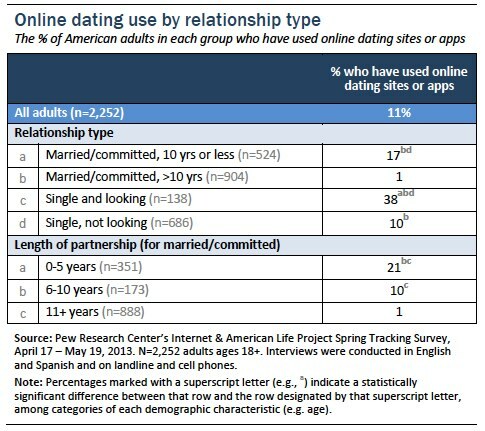 In addition to the usage and attitudinal measures discussed above, we also asked the 11% of Americans who have used online dating about some of their specific experiences with online dating sites and mobile dating apps. Each of these is discussed in greater detail in the section that follows. The relatively small number of online daters in our survey makes it impossible to conduct a detailed demographic analysis of these questions. However, our sample size is sufficient to compare men and women, and any statistically significant gender differences are noted where appropriate. Compared with eight years ago, online daters in 2013 are much more likely to actually go out on dates with the people they meet on these sites. Some 66% of online daters have gone on a date with someone they met through an online dating site or app, up from 43% when we first asked this question in 2005. Male and female online daters are equally likely to have gone on a date with someone they met through a dating site or app. Moving beyond dates, one quarter of online daters (23%) say that they themselves have entered into a marriage or long-term relationship with someone they met through a dating site or app. That is statistically similar to the 17% of online daters who said that this had happened to them when we first asked this question in 2005. Male and female online daters are equally likely to translate their experiences with online dating into a long-term relationship. At the same time, just 4% of online daters have attended a group outing or other physical event organized by an online dating site. There are no differences between male and female online daters on any of these behaviors. 54% of online daters have felt that someone else seriously misrepresented themselves in their profile. 28% of online daters have been contacted by someone through an online dating site or app in a way that made them feel harassed or uncomfortable. 38% of online daters have been matched with or come across the profile of someone they already know while using one of these sites. 22% of online daters have asked someone to help them create or review their profile. Interestingly, women are around twice as likely as men to ask for assistance creating or perfecting their profile—30% of female online daters have done this, compared with 16% of men. All of the behaviors and activities discussed thus far were asked of people who have ever used an online dating site or mobile dating app. We also presented people who currently have a profile on a dating site or app with a series of questions about why they might use online dating, and asked them to tell us whether each of those was a major reason, a minor reason, or a not a reason for dating online. 60% of active online daters say that “meeting people who share similar interests or hobbies” is a major reason they use online dating. 52% say that “meeting people who share your beliefs or values” is a major reason they use online dating. 46% say that “finding someone for a long-term relationship or marriage” is a major reason they use online dating. 33% say that “having a schedule that makes it hard to meet interesting people in other ways” is a major reason they use online dating. 25% say that “meeting people who just want to have fun without being in a serious relationship” is a major reason they use online dating. In addition, we asked active online daters if their profile photo is visible to anyone, and around three quarters of them (73%) said that it was. One in five (20%) said that they control who gets to see their profile photo.